Incoming Freshman and other newbies to the UW have surely heard UW Madison is a world class institution and a great party school, but there is much more than studying, bars and parties. My favorite recreation is dance. There are countless dance groups on campus. There is ballroom, belly dancing, bhangra, break, Irish, swing, tango, tap, Latin, hip-hop, jazz, modern and others at social, competitive and performance levels. Here are some of my favorite dance groups available by search at: https://win.wisc.edu/organizations and on Facebook. Ballroom Association of UW-Madison is a social ballroom group featuring weekly lessons and dances. Known for the variety of music and dance forms, BAM is a great social and fun outlet for beginners through advanced dancers. 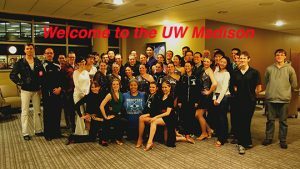 Badger Ballroom Dance Team is a competitive ballroom group with professional coaches that hosts an annual competition and travels to other Midwest universities to compete. Classes are suitable for beginners to advanced dancers. A performance showcase highlights both beginner and advanced dancers at the end of each semester. Los Sabrosos offers classes and workshops suitable for beginners to advanced taught by volunteer student teachers for salsa, bachata, merengue and cha cha. Tango Club UW provides weekly opportunities for the UW-Madison community to learn, practice, and love Argentine tango! Premiere Dance is an audition-based membership who choreographs jazz and modern hip-hop dances. Premiere Dance performs at campus events such as Homecoming, Women’s Volleyball and Basketball games, and other campus events. BBDT Performers Celebrate a Great Showcase!